Despite visiting Barca before, I had no idea it had any sights in the Water-Related Magic category. Therefore, I made it my mission to seek out the Montjuic fountain to see if it was as impressive in person. The fountain and Castle close by are easily accessible (as is the nearby hilltop overlook) from the Parallel metro station on the L3 line. The Montjuic light show runs Thursday through Sunday nights during in summer and operates reduced hours off season. The show runs for 30 minutes and is free of charge. We hit up the first show of the weekend on a Thursday night at 9:30pm. We arrived at Montjuic fountain an hour early and it was teeming with people trying to find the perfect spot. It fills up *really* quickly, so arrive in good time if you want front row. We staked a claim at the barriers surrounding the main fountain and, despite the hanging around, the view is worth the wait. There are tiered seating areas at the rear of the fountain by the Castle, but these fill up even quicker. While offering a prime view from an elevated position, I was keen to be closer to the fountain. Also: I’m not the biggest fan of crowded places, so I need a vantage point with quick-getaway potential. Once the show gets underway you can pretend you’re Monserrat Caballais and rock out with Freddie Mercury to ‘Barcelona‘. You won’t be disappointed unless you were there on the same night as me and had to listen to my singing. If so, I’d like to take this opportunity to apologise. The show is sensational and the fact that it’s free makes it even more enjoyable. If you have some time in the city, it really is a must-see. 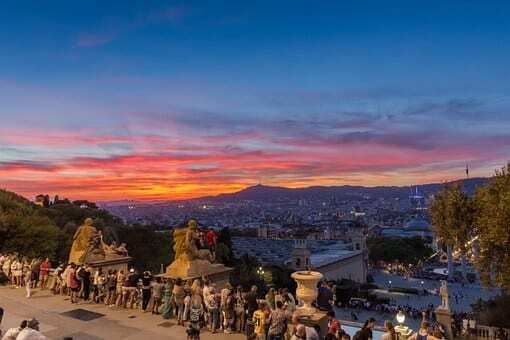 Have you visited the magic fountain at Montjuic? Your pictures are beautiful! Barcelona is very high on my bucket list. Thanks for sharing! I love Barca, it’s such a charming and colourful city.